In 1938, with this official backing, the Hortens set up a facility at Berlin's Tempelhof Airport, where they constructed the Ho III sailplane. The first H III was built at Templehof Berlin in 1938 and the second (H IIIb) was built by Peschke Flugzeugban, also in Berlin. The main change from H II were increase span (20 m), reduce sweepback (23degrees) and modified lateral controls. 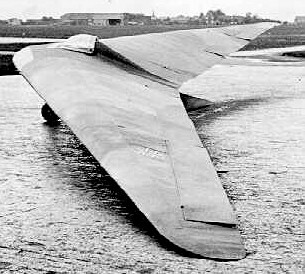 The outer wing panels this time had three movable flaps. The innermost was again a landing flap, but the outer pair were geared so that the outer flap had a large range of upward deflection and, only slight downward movement and, the inner flap large downward movement and slight upward movement. This arrangement reduced unfavorable yawing moments due to aileron by making use of differential aileron movement, but avoided the change in longitudinal trim by the opposing differential of the inner flap pair. In high speed flight the nose down trim was provided mainly by the inner elevon section moving downwards, the outer flap deflecting only slightly; this had the advantage of relieving the tips of torsional loads at high speed. Aerodynamic balance was again by geared tab on sub types IIIa and b, but on IIId, f, and g the outer flap had a 20% Friese nose: out of balance aerodynamic loads on the elevators were trimmed by a rubber bungee trimmer. Drag rudder design remained the same as for the H II. The H III seems to have been a successful and useful type, for 14 were built altogether and several different sub-types developed. Production of some of the sub-types was still going on in 1945. IIIb - Similar, but with outer elevon flap not extending to the wing tip. Same as IIIa but with a fixed front plane. One of these was built, for the 1938 Rhon contest. Very little flying experience was obtained. The idea was to improve CLmax. IIId - Standard wings fitted to a special center section with 32 hp Volkswagen engine and folding propeller. The idea was to produce a high performance sailplane with auxiliary engine for takeoff and climb, which could be shut off for soaring without impairing the performance as a sailplane. Center sections (Opel engine with gear drive) were being produced at Tubingen at the rate of two a month. 12 partly finished were in the workshop in June 1945. Finished parts were sent to the Wornberg and assembled with wings made at Darnsdorf. Rate of climb: 2 m/sec. The engine installation was take straight from the Volkswagen complete with exhaust system and electric starter; it weighed 240 lbs. 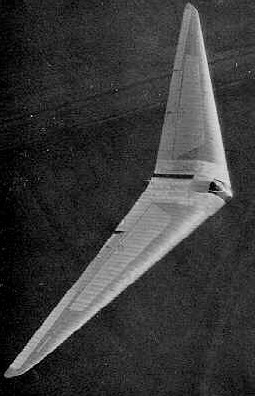 IIIe - H III glider with waggle tips. 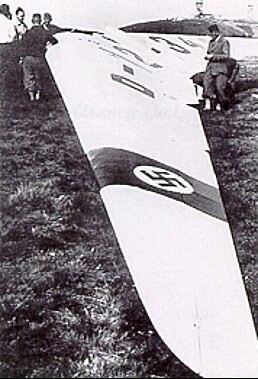 On this aircraft, remains of which were found at Gottingen, the tips were operated directly by the pilot. Same as the IIIb, but with prone position for the pilot. A specimen of this type was found at Gut Nierstein with modified controls. The outer flap had a Frise nose, (as on H IV), spoiler type drag rudders were fitted in place of the usual leading edge split flaps, and H IV type dive brakes installed. The prone piloting position eliminated the need for the head fairing used on the other H III’s and gave the pilot a much better view. IIIg - Special two-seater center section with tandem seats. Specimens were found at Zimmern and Hernberg. This type was used for training purposes. H IIIh / Ho-229 - One built in 1944. No independent opinions are available on the flying qualities of the H III series, but Reimar Horten was insistent that it was a very straightforward aircraft from the pilots point of view. He stated that any glider pilot with five hours experience could be safely sent off solo in an H III. Wing area 344 sq. ft.
Wing loading 2.25 lb/sq. ft.